** Applicants must be enrolled in a full-time PhD program at a university in Africa or India. ** Applicants enrolled in an undergraduate or masters program must be current, full-time students at an African or Indian university. ** Google employees, and their spouses, children, and members of their household are not eligible. ** Students that are already supported by a comparable industry award are not eligible. Just follow the below steps to apply for the Google PhD Fellowship Program 2019. Step 1 : Go to the official website of Google through provided above. Step 2 : Next read the instructions carefully and click on “Apply” link. Step 3 : Fill the application form with the required details and click on “Save” button. Step 4 : Then fill the remaining details to complete the application. ** Three letters of recommendation from those familiar with the applicant’s work (at least one coming from the thesis adviser in case of current PhD students). Students receive named Fellowships which include a monetary award. The funds are given directly to the university to be distributed to cover the student’s expenses and stipend as appropriate. 1. Who should submit the applications? Materials must be submitted by chairs of the department from eligible universities, or their designated contact. In India and Africa, students may apply directly during the application window. 2. Can students apply directly for a Fellowship? 3. How are Google PhD Fellowships given? 4. Will the Fellowship recipients become employees of Google? 5. After award notification, when do the Google PhD Fellowships begin? 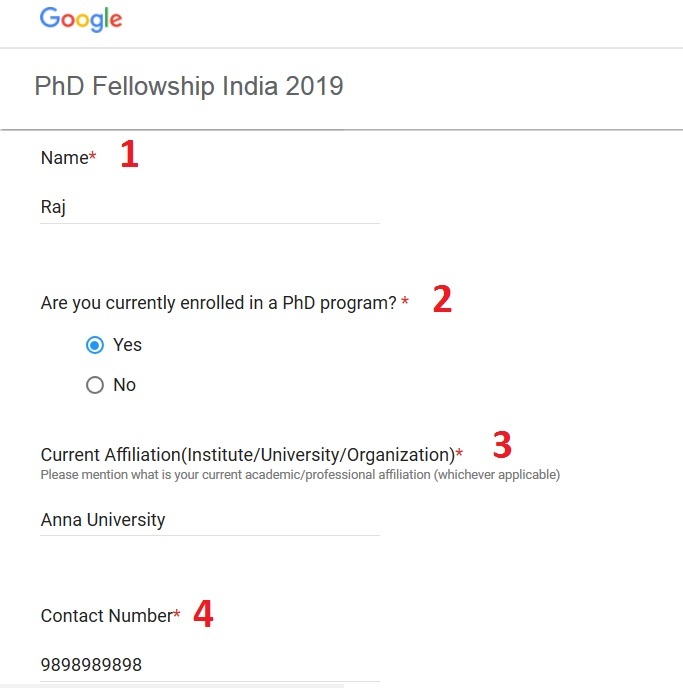 The Google India PhD Fellowship program application window for 2019 is now open until Friday, 12th April 2019 at 11:59:59 PM IST.